After cooking moongdal as stuffed paratha, as evening snack, for the third day of blogging marathon i simply prepared moongdal along with Bulgur aka broken wheat as delicious khichdi as my theme goes for cooking with moongdal. Khichdi is definitely a comforting and soothing food which suits prefectly to anyone. 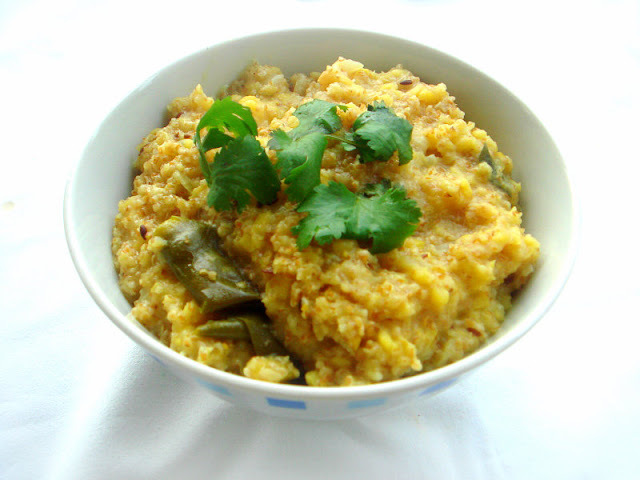 Usually khichdi is prepared with rice,dals and with veggies. But i went for bulgur and yellow split moong dal to make them more healthier. Everyone at home simply enjoyed this healthy food once i served hot,seriously this combination wonders out absolutely awesome.I skipped totally the addition of ghee in this recipe and prepared this healthy food through pressure cooker for quick cooking.This khichdi is definitely super filling,wholesome and a light meal so that you can have it very well anytime of the day. Check out the other marathoners running this 21st edition of blogging marathon here. Take together the washed bulgur,washed yellow split moongdal,finely chopped ginger,turmeric powder, salt in a vessel, add 5cups of water and pressure cook them for 5 hisses as i love my khichdi bit mushy. Heat the enough oil and fry the cumin seeds,slit opened green chillies, bay leaves,curryleaves. Saute the chopped onions and crushed garlic cloves until the onions turns transculent. Once the pressure get released,add this mixture to the tempered veggies to the cooked bulgur-dal mixture, stir for few minutes and put off the stove.. Serve hot with pickle or spicy side dishes. When the kichidi is prepared in this manner, it is such a treat! Nice healthy combination too. What a superb n healthy combo,yummy one pot meal!! I love these mixed lentils healthy khichadi! thats a nice twist. these days I sometimes make barley khichri. will try this once if I get bulgar here in my area. A nice combo! Very healthy and packed with nutrients! Super healthy and yummy ! wheat and moongdal....very healthy comfort food. The kichidi looks awesome, would love to have them anytime. Such comforting meal, and healthy too! Just want the mother recommended to comfort the child :) Love the lentils with broken wheat. Tu me donnes faim à cette heure-ci. Toujours des plats bien parfumés et bien épicés. Quiet healthier version of kichdi. Looks perfect meal for me! Wow That looks absolutely delish and healthy!! Yumm! Sounds very healthy and a quick tiffin Priya.. Perfect side dish, comforting, and delicious! Love it!